What’s The Answer Wednesday: Dry Weave Fabric and Holes » Embroidery Talk Has Moved! Why do I get so many holes in “dry-weave” types of fabric when I embroider on them? What type of needle should I be using? This question came to us from Jenny, who has been having some frustration with dry weave fabrics. She have been averaging 1 -4 holes per shirt right by where the lettering is embroidered. Jenny also tells us that they use a substantial backing and make sure that they hoop the fabric extremely lightly, but the backing is kept taut. You can see the type of fabric about which she is talking in the picture to the right of this text. Fortunately, we do have a few suggestions that might be of help. The first is to check the needle that is being used. For fabrics like a knit or dry weave fabric, you should use a needle that won’t punch holes quite as aggressively. A sharp needle may be too hard on the garment and sever the threads of the fabric, leaving holes. These type of fabrics may respond better to a ballpoint needle. Ballpoint needles have a blunter and more rounded point and push through the fabric, rather than cutting the fabric as sharp point needles do. Ballpoint needles tend to be gentler on more fragile fabrics and are less likely to leave holes. Another idea might be to change the backing that is being used. 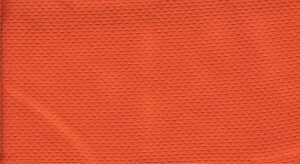 EnMart offers a Super Poly Mesh backing that is designed specifically for knit and dry weave fabrics. It is soft, sheer, stable and translucent, presenting a better look for a finished garment. It also works much better with a ballpoint needle. Since the stabilizer is thinner, the needle is able to peirce it with a lot less force. Even though this stabilizer is soft and is much more comfortable for the person who ultimately wears the garment, it is thick enough to stabilize the fabric and to help keep outlines on track. Finally, make sure to check the digitizing of the design you’re sewing. If you are putting too many stitches into the fabric, you may be pulling it too tight and creating small rips which turn into holes. If the problem occurs consistently with the same design, it might well be worth looking into getting the design redigitized. As a little side note, I do want to apologize for the tardiness of this post. It was scheduled to be written at the end of October, but some health issues occured and I was sidelined from writing for a while. I’d like to thank Jenny for her patience in waiting for an answer. I hope these suggestions are of help. If any of you have additional suggestions for Jenny, please share them in the comments. This entry was posted on Wednesday, November 18th, 2009 at 1:16 pm and is filed under Uncategorized. You can follow any responses to this entry through the RSS 2.0 feed. Both comments and pings are currently closed.